Redondo Union’s Marcelo Enriquez who won his 400th game coaching the Lady Seahawks this season and his 5th CIF-Southern Section championship and Jarvis Turner who led Beverly Hills boys to their first CIF-SS title since 1969 has been named the girls and boys Southern Section coach for the 17th annual Collision All Star basketball game on April 18 at Los Angeles Southwest College. 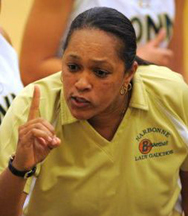 Narbonne’s Victoria Sanders who has coached the Lady Gauchos to two CIF-Los Angeles City championships and El Camino Real’s Joe Wyatt who led his team to the CIF Los Angeles City Section D-I crown in 2014 will coach the City Section girls and boys teams at the event which features seniors representing their section. Sanders has coached the City girls team at Collision three times and has led the City girls to two of their three victories in a series dominated by the Southern Section 13 - 3. Enriquez and Wyatt will be making their Collision debut, while Turner served as a co-head coach with Reggie Morris Jr. at a pervious Collision. The boys series is tied at 8-8 and the winner of this game will brake a long running feud between the two sections which has been played out in cross sectional and championship play. The girls game will tip at 5p.m. and the boys game will tip at 7p.m. Tickets for the event are $10 for adults and $5 for children under 12. Collision is being presented by Buffalo Wild Wings and Sheikh Shoes and will also honor the student academic achievers.